SysInfoTools Pptm Repair is a powerful repair/recovery tool which successfully restores content from a severely damaged MS Powerpoint 2007 Pptm files. And save recovered files to the user defined location. SysInfoTools Pptm Repair is a powerful repair tool which successfully restores content from a severely damaged Pptm file. It efficiently recovers unreadable data from corrupt Pptm files and recover data as much as possible from them. 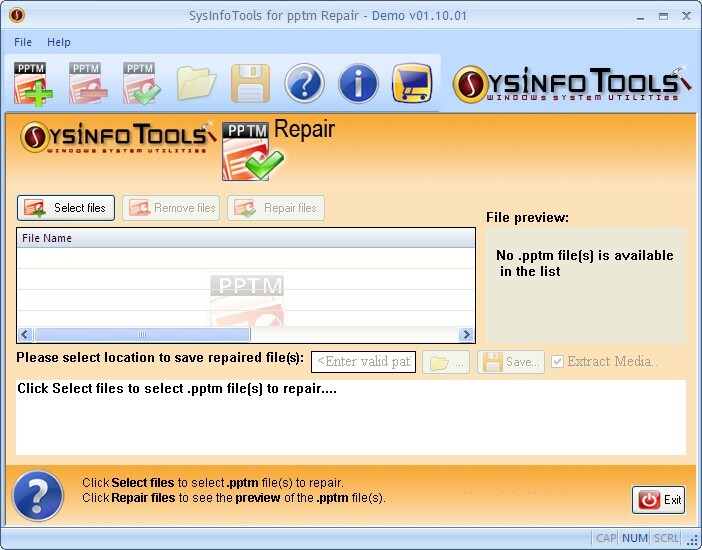 SysInfoTools Pptm Repair does not modifies the existing content of the file it only reads the data present in the file and save the data to the user defined location.